When you run a report against your transaction system, the data that is returned is exactly as it exists in that system’s database. These reports present a snapshot in time, which is great for giving you a read on what has happened up until today, exactly as it was captured. For example, How many people started? How many performance reviews were completed? How many people got 5s? 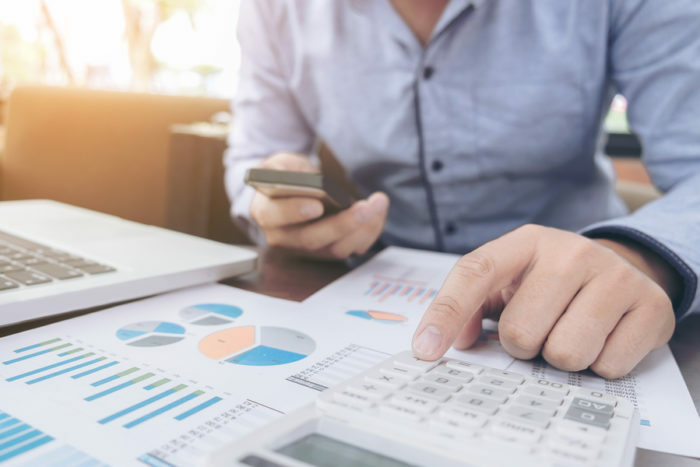 When transactional data is sent to an analytic solution, there is an opportunity to transform the data values that exist in the source system into new values, either to introduce standard values or to correct for common data-entry mistakes. For example, an organization that has two solutions for performance – one using a 4-point rating scale and one with a 5-point scale – wouldn’t be able to look at performance across the organization in a meaningful way because top performers from the 4-point solution would just look like above average performers alongside the employees who got a 4 rating from the 5-point solution. Once the data has been added to the analytics solution, the query engine (the mechanism that retrieves the correct data for the user, based on what analysis the user has chosen to look at) can derive new values from the existing metrics. For example, an organization may choose to define the “Top Talent” metric to mean those employees with top performance scores, critical jobs, and a tenure longer than 5 years. The solution stores the data for performance scores, and critical jobs. 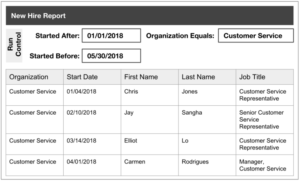 When the user chooses to look at an analysis that includes “Top Talent,” the query engine first calculates tenure (based on the stored Start Date), then determines which employees meet the “Top Talent” qualifiers. This new metric is calculated in real-time each time the query is run, offering a more nuanced, value-added view of the performance data. Powerful analytic query engines can also predict future actions based on the patterns of the past; the difference between reviewing who has left and predicting who will leave. For example, Visier uses the random forest predictive methodology which you can read more about here. So, at last, we come back to the adage we began with: “Reports provide data; analytics provide insight.” What this article has attempted to show is that reports are the outputs of systems that are designed to perform actions – not provide insight. Insight is the deeper understanding you get of the actions and behavior behind all of the data points you’ve gathered. It is the ability to make out the big picture from the millions of brush strokes that created the painting. 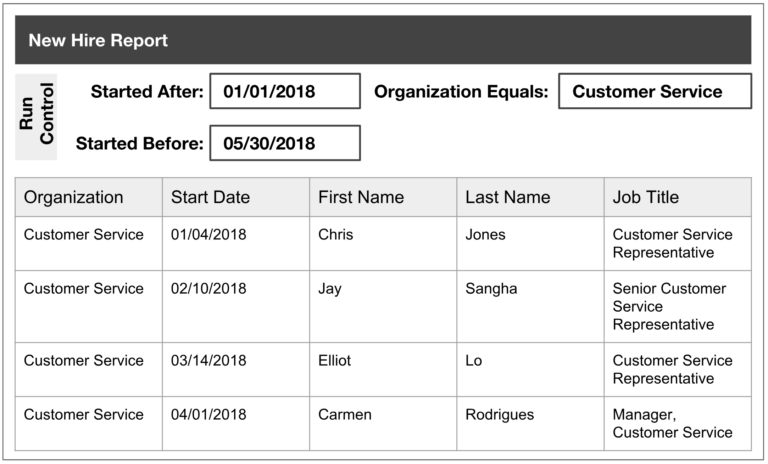 Taken individually, an employee record tells you about one employee. 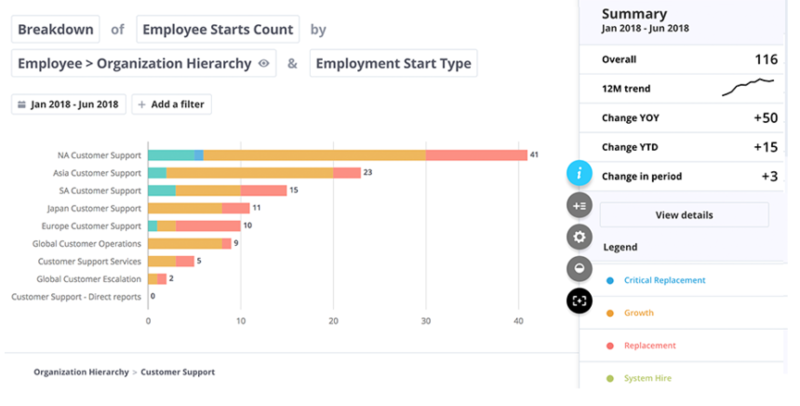 A report on hundreds of employees tells you about hundreds of employees – but an analysis of all this employee data can illustrate the connection between new hire training and turnover. The insight comes when you can see that employees who have participated in the new onboarding training have a lower rate of turnover; therefore, it may be worth expanding the pilot across the organization. With this insight, you can make the business case for the program to your leadership. An analytic solution leverages all of the data created by your transaction systems so you can explore it from many different dimensions and get real insight into your organization. Because analytics connect data in a way that facilitates explorations, displays patterns and trends through visuals that enable understanding, normalize data to facilitate comparisons, and derive new values that boost insight, analytics are a much more powerful business transformation tool than reports could ever be.